We must bring awareness to this research and encourage the USDA and Congress to create legislation that supports organic farmers,” said Smallwood on Wednesday night as he marked the halfway point of his trek. “Only organic farming can stop the chaos that we have created—chaos that is deeply impacting our environment on so many levels. Solving the long-term climate equation means getting to a zero carbon economy devoid of fossil fuels. It is widely acknowledged that we are not going to arrive at a new low-carbon economy any time soon; the technologies, markets, political and social structures needed to shift the world’s economies are not materializing quickly enough. In the decades it will take to decarbonize the economy, an unacceptable level of warming will become locked in. With each passing year of inaction, hope for our planet’s future becomes harder and harder to rally. We are on a trajectory of too little too late. If we wait, our only hope for the future lies in yet-to-be-discovered technological fixes coupled with the loss of whole cultures and species. The numbers are so sobering that untested technologies for carbon capture and storage have in short order gone from unsafe, outlandish whims to pressing societal needs: bioengineering the human body has even entered the climate conversation. And yet, there is hope right beneath our feet. There is a technology for massive planetary geoengineering that is tried and tested and available for widespread dissemination right now. It costs little and is adaptable to local contexts the world over. It can be rolled out tomorrow providing multiple benefits beyond climate stabilization. The solution is farming. Not just business-as-usual industrial farming, but farming like the Earth matters. Farming like water and soil and land matter. Farming like clean air matters. Farming like human health, animal health and ecosystem health matters. Farming in a way that restores and even improves on soil’s natural ability to hold carbon. The concept that is most critical to understand about what Rodales research, explained Smallwood recently, “Is that were not talking about slowing things down. Were talking about the capability of regenerative organic agriculture being able to actually reverse and draw down the excesses” of carbon and other greenhouse gases that are now overwhelming the capacity of the planets atmosphere. 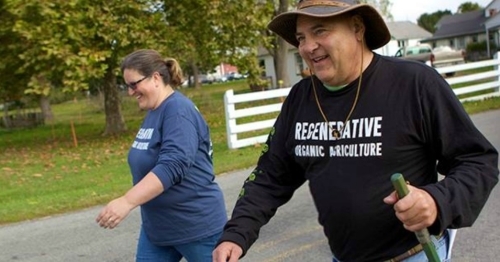 Read the full story via The Solution Is the Soil: How Organic Farming Can Feed the World and Save the Planet | Common Dreams | Breaking News & Views for the Progressive Community.